The brilliant, dreadful We Happy Few is set in a British town called Wellington Wells in an other 1964, where a non-Nazi "German Empire" won World War II after America stayed nonpartisan. While under German occupation, the general population of Wellington Wells accomplished something horrible — so appalling that they eradicated their recollections with an euphoric psychedelic drug called Joy. A few decades later, Wellington Wells is an awesome, rainbow-tinted cutting edge police state where being a medication free "Killjoy" is unlawful and each respectable native games a for all time grinning veil. The town's framework is breaking apart, a torment is tainting occupants, and the edges are loaded up with Joy-safe "wastrels." But no one is sufficiently discourteous to specify all that, in the event that they see by any stretch of the imagination. 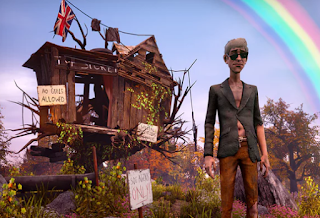 We Happy Few draws from the works of art of British tragic fiction, bringing out The Prisoner's saccharinely vile Village, Brazil's code word shrouded retro-futurism, Brave New World's medication energized false ideal world, and 1984's Oceania with its always reworked past. In any case, it has a uniquely dreadful kind of rustic comfort. Your characters actually know everybody around the local area by name, since the amusement creates (greatly, originally British) names for each and every spectator, adversary, and carcass. A great deal of experiences are obscurely, foolishly entertaining in light of the fact that they include characters showcasing an act of typical life in a for all intents and purposes dystopian scene. This goes far toward making We Happy Few's high-idea setting valid. The amusement uncovers the town's barbarity at an early stage, yet it omits most inquiries concerning how Wellington Wells set up its super cutting edge society and what whatever is left of the world resembles. This is a strong piece of story train, so it's too awful that the greater part of the amusement is such a wreck. Wellington Wells' occupants are on the other hand so brutally idiotic thus barbarically nimble that acing its basic stealth mechanics and awkward scuffle battle feels silly. My PC duplicate of We Happy Few additionally glitched always. Characters regarded gravity as to a greater extent a recommendation than a law, and I needed to surrender or restart missions since objects had vanished or essential characters had quit responding. Furthermore, attempting to settle bugs by reloading an auto-spared checkpoint makes a difficult situation since you need to stop to a primary menu to stack a spare, yet stopping overwrites the autosave with your most recent advance. The general surrounding puts a peculiar, marginal sexist turn on Sally's area. Arthur and Ollie are both making up for obviously unsafe decisions they made amid the occupation, and their circular segments take after a characterized example of recalling a minor transgression, going on a trip of recovery, and going to an unmistakably ghastly disclosure about themselves. All that we find out about Sally, however, proposes that she's attempting to offer reparations for entering associations with oppressive men. The account structure paints this not as nonsensical self-hatred, but rather as freely identical to Ollie and Arthur's choices. I question this should happen, however it's some way or another fitting: while my adaptation of the amusement probably won't be genuine, in any event it makes me upbeat. I don't think We Happy Few is currently attempting to draw these equivalences. The amusement just loses control over its own plot and worldbuilding as it advances, to the point that I'm not in any case beyond any doubt whether some weird minutes were bugs, and whether some narrating decisions were purposeful or not. A couple of the scenes that distinctive heroes share with each other, for example, change content or area relying upon who you're playing. The guide of Wellington Wells changes between characters too. This is likely the consequence of account streamlining and Compulsion's dependence on procedural age since it doesn't fill an unmistakable need for the plot. Be that as it may, the most serious issue is that We Happy Few keeps running far, awfully long — particularly in light of the fact that it approaches Arthur, Sally, and Ollie's goes about as one interlocking story. Arthur has the most broadened and brilliant circular segment, and his story bookends the diversion, which sets up Ollie and Sally's goes about as digressive. We Happy Few at first propelled as an "early access" sandbox survival amusement in 2016, while the group took a shot at a story-centered battle. The last item rests ponderously between a lumpy searching test system and a Dishonored-style slippery immersive sim. I hit a serviceable adjust of story and survival from the get-go, yet the survival parts before long ended up irritating busywork bolting up the story. Sally battles basically by showering or infusing adversaries with drugs, which implies each and every takedown requires exhausting constrained assets. Ollie is questionably diabetic (the diversion just calls him "unwell"), so I limped around, gradually amassing a honey bee evidence suit for gathering nectar that he could infuse with a searched syringe. That is the sort of computer game creating shorthand that sounds progressively silly as you really type it out.